Formal Ontologies Meet Industry (Frontiers In Artificial Intelligence And Applications): 9781586038717 Hardcover - LIMEROCK BOOKS INC. 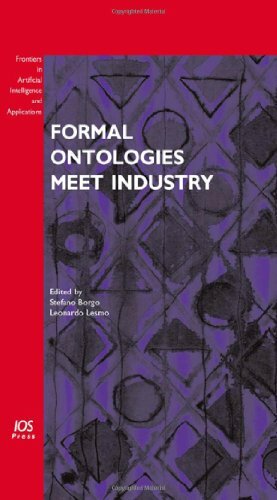 This volume contains papers that analyze and discuss issues related to methods, theories, tools and applications based on formal ontologies. There is today wide agreement that knowledge modeling and the semantic dimension of information plays an increasingly central role in networked economy: semantic-based applications are relevant in distributed systems such as networked organizations, organizational networks, and in distributed knowledge management. These knowledge models in industry aim to provide a framework for information and knowledge sharing, reliable information exchange, meaning negotiation and coordination between distinct organizations or among members of the same organization. It has been shown that formal ontologies play a central role in describing in a common and understandable way the logical and practical features of the application domain.The success of the methodologies associated with knowledge modeling and ontologies led to increased need of a comparison between different approaches and results, with the aim of evaluating the interdependencies between theories and methods of formal ontology and the activities, processes, and needs of enterprise organizations. This book pays particular attention to ontology in relation to business, enterprise, enterprise knowledge, practice and linguistics.